Because of their ability to survive greenhouse and windowsill conditions, easy hybridisation and because of their beautiful flowers, there are probably only a few gardeners who have never grown pelargoniums. Most nursery grown plants are, however, cultivars. Controlled hybridisation started two centuries after their arrival to Europe in 1600 and reached its peak in Victorian England. The history of species' introduction closely mirrors the historical relationships of some European countries and is an interesting subject in itself. It also tells a lot about the origins of high (horti)cultural awareness in these countries. The first plant to reach Europe was probably brought to the Leiden botanical garden already before 1600 and was P. triste. From there, it passed to France and in 1631, the Englishman John Tradescant obtained a few seeds from Rene Morin in Paris. Since the plant came from a trip to the East, it was considered to originate in India. In 1672, the Dutchman Paul Hermann was probably the first botanist to collect pelargoniums in southern Africa and sent seeds to Jacob Breyne, who illustrated a few species in 1678. On return, Hermann devoted his time to the garden of Leyden. Thus some plants reached the botanical garden of Amsterdam, where Jan Commelin described a few species and later his son Caspar a dozen or so more, all before 1710. 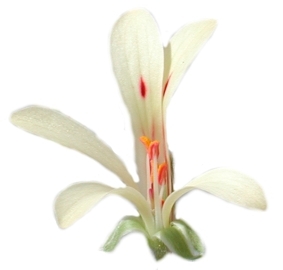 Caspar Commelin was succeded by Johannes Burman, who introduced the name pelargonium in 1738, although for some of the south African species of the genus Geranium. The exchange of knowledge and plants between Dutch and English botanists and gardens was extremely intense in the time, so that some species were soon grown in Oxford and Chelsea. In Madrid, Antonio Cavanilles studied them, and in Vienna, Nikolaus Jacquin. The Schönbrunn gardens were laid out by gardeners from Leiden and known to rival Kew in the first half of the 18th century. In France, one of the most important taxonomic works was published by Charles-Luis L'Heritier, who described already 90 species, published after his death in Aiton's Hortus Kewensis in 1789. From Kew, Francis Masson, a Scotsman, was sent to southern Africa in 1772 in order to collect plants and seeds. He met and occasionally travelled with Carl Thunberg from Sweden, a pupil of Carl Linne. A few years later, Anthony Hove (originally Anton Hoveau, from Warsaw) was sent from Kew to India in 1795, and stopped in Lüderitz Bay, in present day Namibia. There he collected 17 species, of which only P. crassicaule, P. cortusifolium and P. ceratophyllum survived. Similarly, William Paterson was sent in 1777 by the Countess of Strathmore to explore the western coast of southern Africa, and discovered P. sibthorpiifolium and P. klinghardtense. In London, there were already a few nurseries in the 1780s including James Colvill's in Chelsea, specialising in south African bulbs. Eventually, it housed a large collection of pelargoniums. Robert Sweet started working in his nursery in 1819 and later published the monumental five volumes on Geraniaceae. At the end of 18th century, the political situation in southern Africa changed as the British took over the control, however, plant collecting became more risky. Maybe because of that, the interest in England turned to hybrids. They became so widespread that the original plants soon became rare. The zonal and the regal cultivars, the ivy-leaved and the uniques became fashionable, while the species were kept as curiosities. In 1912, the German Botanist R. Knuth wrote the last taxonomic revision, before van der Walt's group in Cape Town started a huge taxonomical enterprise culminating in publication of the first volume on pelargoniums of Southern Africa in 1977, succeeded by another two. Towards the mid-18th century, the pelargoniums also found their way to the States and Australia and became increasingly popular in California, where the climate was (and remains) favourable. This lead to an exponentially increasing number of cultivars, which however stopped with the beginning of WWI. Not only the gardeners and cultivars themselves, but also the parentages and names were lost, so that the principal aim of many societies today is to recreate the long gone hybrids. The trend of today is mass-production of a few cultivars, so that the old-fashioned production of cultivars and selection is restricted to those gardens whose dedicated gardeners still enjoy the unexpected suprises of hybridisation. 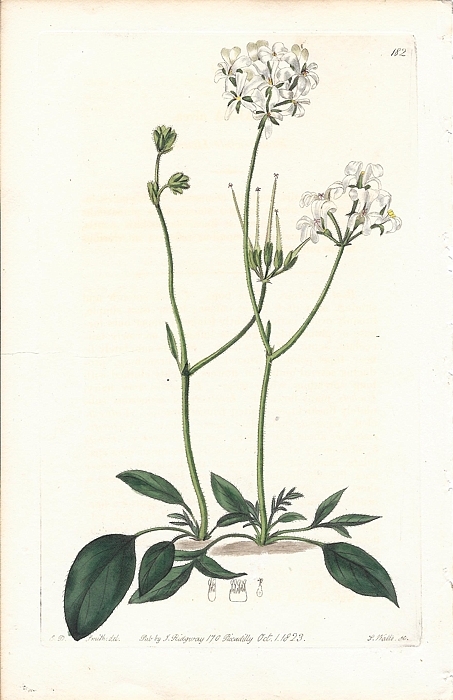 Hoarea nivea Sweet, beautifully illustrated in Sweet's Geraniaceae: The Natural Order of Gerania (1823, Tab. 182). The name was then transferred to Pelargonium by Loudon, and then finally recognised as synonimous with P. violiflorum by De Candolle. Sweet eagerly described many forms and hybrids (or mules, as they were called then) under different names. In his description of Hoarea nivea, he clearly indicated its close relationship with Hoarea violaeflora, but went ahead with the new name anyway. It is useful to remember that Sweet was a nurseryman and it was in his interest to publish (and sell) as many plants as possible. The practice of publishing a species without a proper understanding of its natural variation sadly continues into present day, although the Victorian craze for pelargoniums is long over.